When there is an earthquake or a tsunami, media crews scramble to the zone of destruction to bring back searing images of death and destruction, and donations pour into World Vision, the giant Federal Way-based aid organization. Yet, the donations have been slow to flow to a less dramatic yet far more wide-ranging disaster — this one driven by conflicts and, in some areas, drought — that now threatens famine for more than 20 million people in nine African nations and Yemen. Back in March, United Nations Emergency Relief coordinator Stephen O’ Brien, after visiting the region, declared it the worst humanitarian crisis since the 1945 creation of the international agency. But in America, it’s been a sleeper of a story compared with the tumultuous political saga of President Donald Trump’s first half-year in office, months filled with controversial tweets and a still-unfolding tale of Russian efforts to influence the November elections. To raise public awareness, eight of the largest U.S. aid groups, including World Vision and Portland-based Mercy Corps, are trying something new. Rather than competing with one another in separate fundraising efforts, they are banding together in a first-of-a-kind joint appeal that launches this week. The Global Emergency Response Coalition has recruited actor and activist George Clooney to narrate a plea for donations, and corporate sponsors include Twitter and Google. “We have seen that America is very distracted, and I think you have another phenomena — that some Americans are just so fed up with the news,” said Richard Stearns, president of World Vision. The most hard-hit countries are Yemen, just across the Gulf of Aden from Africa, Somalia, Nigeria and South Sudan. In these nations, the suffering is largely man-made as conflicts have disrupted farming and dislocated millions. In other areas, drought has taken a toll. 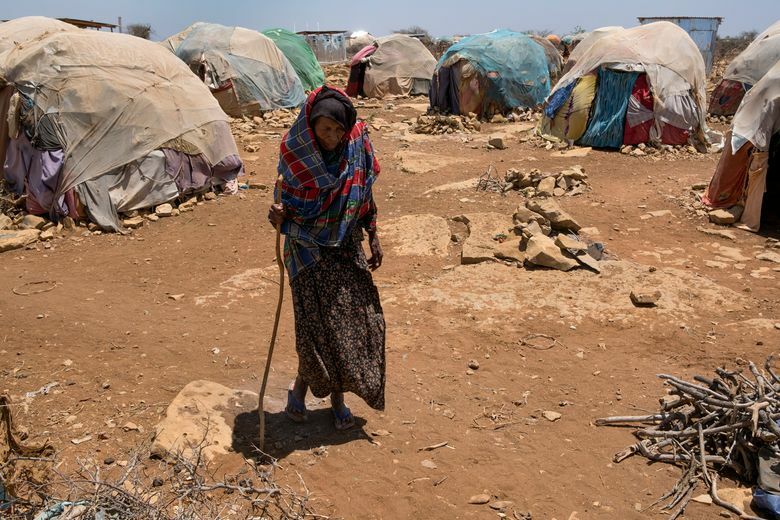 In June, Stearns visited nomadic herders in a hard-hit area of northern Kenya, where pastures have withered, cattle carcasses litter the land and children are dying of hunger. A bare-bones-staffed World Vision nutrition center had only two nurses trying to offer supplemental feeding to hundreds of malnourished youth. “I don’t often feel helpless as a World Visions president, but I am feeling kind of helpless right now,” said a tear-choked Stearns in a video report from Kenya. The private aid appeal comes at a time of big uncertainties about the scope of U.S. government assistance under the Trump administration. Reuters reported that the president, at the G-20 summit earlier this month in Hamburg, Germany, pledged $639 million to the United Nations to provide assistance. for the troubled nations, bringing the total U.S. commitment o $1.8 billion for the fiscal year that ends Sept. 30. But for the upcoming fiscal year, the Trump administration proposes steep cuts to humanitarian aid that include eliminating a $1.8 billion Food-for-Peace program that has helped to combat overseas hunger and wide-ranging reductions in other types of disaster-response programs. Congressional appropriations committees are not going along with these cuts. But the aid budget is still likely to fall at a time of dramatically rising needs that — in addition to Africa and Yemen — also include the refugees from war in Syria. Mercy Corps’ Deepmala Mahla, the country director for South Sudan, will call for increasing the aid in testimony she is scheduled to give Tuesday before a Senate subcommittee. “My message will be, “People are dying, this is not the time to talk about aid cuts,’ ” Mahla said Friday. She said the U.S. aid money in South Sudan has helped to pay for water-hygiene work that is helping to save lives that otherwise would be lost to a cholera epidemic. Mahla said she has met with mothers who train their children to eat on alternate days. Others have taken refuge deep in the swamps, subsisting on leaves and wild fruit. In addition to Mercy Corps and World Vision, other groups in the coalition are CARE, International Medical Corps, International Rescue Committee, Oxfam America and Save the Children. Donations to the coalition will be divided up equally among the groups, with no more than 5 percent used to cover the costs of the appeal.